This species was the first in the Section Oxyglossum to be described when, in 1821, Caspar Georg Carl Reinwardt, a Prussian born Dutch botanist made a collecting trip to the north Molluccas. He founded the Botanical Garden at Bogor whence much of our early knowledge of Indonesian orchids emanated. Among the species bearing his name are the Javan Trogon, an Indonesian flying frog, the Blackcap Babbler and the range-footed scrubfowl. He was professor at the University of Leiden from 1823-45 and died, aged 80 in 1854. Your editor first saw this miniscule species growing on moss-covered twigs at Mount Hagen in New Guinea. But Dendrobium subacaule is not confined to New Guinea as it is also found in the Solomon Islands (Guadalcanal). It is one of the smallest species in the section; only Dendrobium delicatulum and Dendrobium putnamii are smaller, but it is quite startling to find. The plants are typically only an inch (2.5 cm.) high and so are mostly hidden in the mossy substrate. But when the red flowers appear it fits Canon Cruttwell’s description of ‘Twigs Aflame’. 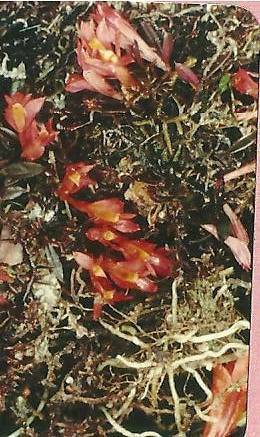 They are not always red: purplish-red, orange and even yellow specimens have been found. All flowers have the characteristic orange-red lip. Culturally it presents problems. Because of its small size, it needs special care. Seedlings are about 1 cm. high and have good roots. They can be started off in sphagnum until growth is apparent and then either potted in fine bark compost or tied to a mossy twig. They should not be allowed to dry out. As the species is found up to 2500 metres (over 8000 ft), it is cool growing and conditions that suit Sophronitis will suit this too. Wet and windy! When the flowers appear, they can last for up to six months!